Kika Emoji Keyboard is an app with the next generation emoji features which is powerful than our words to express the emotions. Apart from the Whatsapp and Facebook app keyboards where we meet the emo’s, The Kika Emoji Keyboard brings them in all the text areas we met. The Unicode encoding powerfully manages the emoji in any input parameters. Apart from the normal keyboards which allow the usual inputting tasks, the Kika has its own importance in explaining our thoughts with attractive emos and GIF. 800+ emojis are quite able to express any thoughts in our body. You can smile, cry, angry, laugh in any of the text areas you’ve seen by simply choosing the right emos of your choice. To get started with this mighty versatile keyboard, you must have the Kika emoji keyboard app. Download it from the link below and continue reading the Kika emoji keyboard review. Now, you have the emoji app in your pocket, then, it is the time to install it. The simple and completely guided installation process can partner you until the emoji keyboard successfully installs on your smartphone. You can choose 100’s of different themes for your keyboard. Some of the beautiful keyboard themes are shown below. Themes can be downloaded as per your intentions or you may manually create one using the app. The layout and the size customization features of the Kika remind you that, you are the supreme authority of the keyboard. The emoji’s of this app is quite brilliantly designed to meet the exact requirements of the users with its simple and powerful design. Never face a difficulty in expressing the genuine expressions on your mind and never adjust with the near same emoji’s. Instead of that, use the exact emoji as you are kept on your mind. You can see the mighty emojis on the app in the screenshot below. Apart from these, There are some predefined patterns to use with the apps. The GIF’s are quite good to use with the app. Expressions are fulfilled with its extreme visibility through these catchy GIF’s on the emoji app. The Kika emoji is not only a funny emo keyboard, but it is a powerfully integrated and well-manipulated android keyboard including all the features of a standard Android keyboard. If you are in search of more than a keyboard, The emoji app is the best solution you can find at the present stage. We may add some useful plugins to the keyboard and make it more versatile. In the middle of our conversations, we may need to search something on the web to answer our sibling. Usually, we may minimize the app and opens some browser and searches for the keyword and come back to the app and answer him. lol… what a long task. The emoji app, let you open a search window in its own window. The only thing you need to do is to search and answer. Now, you realize the fact that, it is not only a simple keyboard which inputs some emos but a powerful tool which can make any of the text areas a simple playground. Consists of all basic features of standard android keyboard alongside with some extra ones. 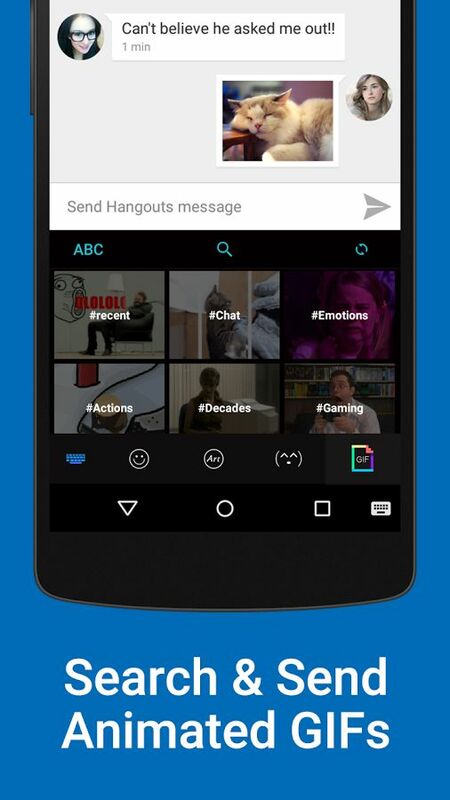 100’s of GIF’s and 800+ Emoji’s are quite able to fulfill all your needs. Unicode 7 and 8 support for using WhatsApp and iOS-style Emoji. To make the keyboard more versatile, a plugin section is built in it. Some users face some bugs while using it. Doesn’t works in a few apps. 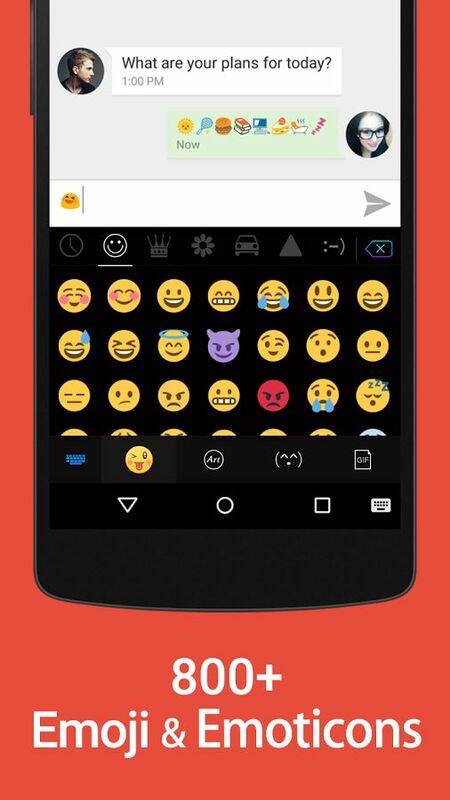 Kika Emoji Keyboard app is the all in one replacement to the native android keyboards. The best way to add the emos and GIF’s in all the work areas as you prefer. This is a good app to consider if you want something more than just a keyboard. Almost identical to sister app kika keyboard. Just tried both latest versions. But Kika.keyboard no ads 1.99, Emoji kika no ads 4.99.